Citing sub-zero temperatures and howling winds, the U.S. Postal Service has suspended delivery in a wide range of states, from North Dakota (where an icy roadway is seen here near Wahpeton on Tuesday) to Ohio. Extreme cold is forcing the U.S. Postal Service to shut down mail delivery in parts of 10 states in the Great Plains and Midwest, reflecting the perilous threat of a polar vortex that's bringing record-low temperatures and biting winds to a broad swath of the U.S.
"Some places could see wind chill readings as low as 60 below zero," the postal service said in announcing the rare decision to keep its mail carriers from making their rounds on Wednesday. From North Dakota and Nebraska eastward into Illinois and Ohio, it's too cold and windy in many places to deliver the mail, the USPS said. "Employee safety is a top priority for the Postal Service, and this decision was made for their safety," USPS spokeswoman Kim Frum said. Many public comments echoed that sentiment after the service announced the move on Twitter. "Thank goodness. I really don't need my mail that badly," Jen Cameron replied, adding, "For real." Others wrote that the USPS should extend the suspension to an even broader area, with several people saying the entire states of Ohio and Illinois should be on the list. If you're thinking the mail suspension runs counter to the motto "Neither snow nor rain nor heat nor gloom of night stays these couriers," we'll remind you: That motto is not the official slogan of the USPS. But the phrase became bound to the mail carriers' public image after it was engraved on a post office in New York City. The motto also doesn't specifically mention intense cold — and that's the danger posed by this weather system, which caused Chicago to wake up to a temperature of minus 22 Wednesday, member station WBEZ reported. In that city and elsewhere, the wind chill is even lower, driven by strong winds. "The dangerously cold wind chills could cause frostbite on exposed skin in as little as 5 minutes," the National Weather Service says, in a wind chill warning issued for parts of Illinois and Indiana. "In addition, the gusty winds will result in areas of blowing snow in open areas through early afternoon, which could result in significantly reduced visibility and hazardous travel." Along with the Postal Service, many school districts, governments and businesses have shut down operations for the day, out of respect for the subzero temperatures and wind chill. 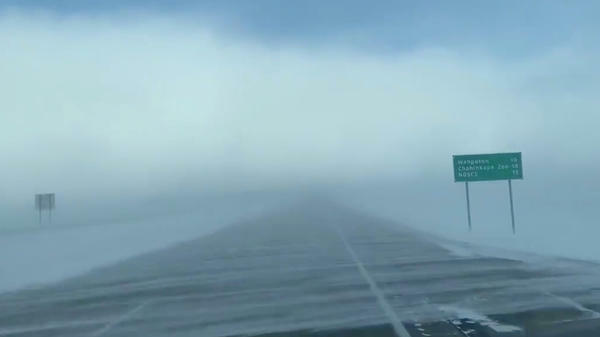 "While it usually sits over the Arctic, the polar vortex is being pushed south by an unseasonably warm air mass to the north," as NPR's David Schaper reports from Chicago. It already was so cold in Chicago on Tuesday that to keep trains running safely, rail crews used fire to protect tracks from the weather in the area of a junction. Chicago's Metra rail agency says the gas switch heaters use the controlled flames to "help keep switches clear of snow and ice." If not for the heaters, Metra says, switch points could get clogged. Post by WESH 2 News. The USPS says it's not delivering mail Wednesday in the below areas — and we'll warn you that the list has fluctuated. Parts of Kansas and Pennsylvania were once on the list, for instance, only to be removed later.